Friend Rahat Dar is one top-class shutterbug and I love his 'Dar side of the Picture'. And he is responsible for setting me off with this one when he printed a picture of the kos minar in Baja Lines, Garhi Shahu (TNS, 29 July). The caption to the photo says this particular piece was built by Sher Shah Suri. Balderdash! So here goes. While in Montana USA, a one-day trip was arranged for the international students to see the plains and lush green mountains in autumnal colours. I woke up early morning to leave for the foreign students' office at Montana University. We were supposed to leave for the Glacier National Park at 7 am along with other international students from India, Romania, Japan, China, West Africa, America, Pakistan, and France etc. Ever since we, the people of the subcontinent, converted to Islam and realised that the Arabs who led us up this garden (of Eden) path looked down upon us poor converts, we began to despise our pre-Islamic past. By the 13th century we were fast inventing illegitimate Arab fathers for ourselves to cover up our pagan past. And so when it came time for partition in 1947 all those of us who had lagged behind earlier became not just ordinary Arabs but Misters to boot -- for that is what the word Syed means. That was one thing. We also did not wish to be seen preening ourselves over Mehrgarh and Harappa etc. But there was nothing we could do about them, so we rather reluctantly tolerated them - if we had our way we'd demolish them and say, 'What Moen jo Daro?' The deluge of Noah wiped everything off the face of the earth, remember. So whatever else was available to convert to Islam we duly did. One thing that we went whole hog with was the Grand Trunk Road. I always like to refer to it as the Rajpatha -- Royal Road while my esteemed teacher Dr Saifur Rahman Dar calls it Utrapatha -- the Northern Road. Since partition (or were we at it earlier also?) we have struggled very hard to plonk it squarely in the lap of the only Muslim builder we know: Sher Shah Suri. Do not forget that all others we are eternally proud of for their acts of vandalism. The Grand Trunk Road was available and history also said that Sher Shah had taken much trouble to build it, adorn it with trees, inns and postal stations. So we thought that there were just no roads or anything else until Mr Suri came along and that we the people of this wonderful land were either trees or rocks firmly rooted to the earth. Nothing could be farther from the truth. We, our ancestors, were great travellers. We gallivanted around for everything that people gallivant about for: we went trading, we sought nirvana, we thirsted for knowledge and we simply went exploring. My guru Dr Dar points out, 'Since ancient times this land was covered by a great web of roads.' One of those was the Grand Trunk Road that stretched from Bengal in the east to Kabul in the west. I have not read Kautilya's Ardshastra and cannot comment on what he did or did not write on this great road, but my guide as been Megasthenes. He was a Greek diplomat who came to the Mauryan court at Patliputra (Patna, Bihar) to look after the interests of Seleucus Nikator, Alexander's successor in Syria. The great Chandragupta was king and the year was 300 BCE. Megasthenes spent the next fifteen years in India travelling about and when he went home he wrote a book. The Indika comes to us in fragments, but it still is a wonderful window to our land twenty-three hundred years ago. Among all the other things, it particularly mentions the road that connected Kabul with Patliputra. The Indika tells us that Chandragupta had the equivalent of the modern Highways Department whose overseers ensured that the roads were in perfect fettle. That there were inns at intervals equal to a day's journey and that these roads were shaded by spreading trees. Thank heavens some moron had not yet brought the accursed eucalyptus out from Australia. At crossroads signs told travellers what town or city lay in which direction and presumably bills were not plastered over them as it happens in Pakistan today. Megasthenes also writes, and this is the star, that there were distance markers placed at every ten stadia. Now, the ancient Greek measure of stadion equalled two hundred and two and a quarter English yards. Ten stadia, according to the historian John McCrindle, therefore correspond exactly to the shorter Punjabi kos. We had kos minars sprinkled all over this land back in classical times, nearly two thousand years before Sher Shah was born. The kos minar, however, was not restricted to the subcontinent. It was in widespread use here and in Central Asia as well for the same purpose as ours, that is, as a direction and distance marker. A Macedonian merchant of the 2nd century CE tells us of their existence in the valley of the Syr Darya near Tashkent in Uzbekistan. No idle boast was this too. For Tash is stone and kent pillar or mound. Similarly we have two places each called Tashkurgan. One in northern Afghanistan (now renamed Khulm) and the other as you cross into China from the Khunjerab Pass. All these places, if we are to believe the Macedonian merchant, had stone pillars. The crux then is that we had kos minars in use long before Sher Shah Suri came around to restore the ancient highway. And that was all he did: restore. As for that particular kos minar, badly encroached upon in Baja Lines, it was built, sadly, not by Sher Shah but by Jehangir. So, dear reader, the next time someone points out a bit of ancient road, a bridge, a stepped well or a kos minar and tells you it was built by the good Suri king, attack them physically, verbally and spiritually. As we crossed the exotic countryside and the great green hills studded with pine trees, we saw animals ranches and large fields with little signs of population or housing. As we approached the Flathead Lake, there were open places and gentle rising hills. The Flathead Indian Reservations called tribal areas are spread over the Montana state, where those Americans and non-Americans live who receive allotment from the Federal government. Till the 18th and 19th century Native Americans had reserved lands, just like our country. On the way we crossed Ronand Town and then another 10 kilometres away was Polson town. Near the Polson Town there is Flathead Lake, which is fed by the Glacier water. The lake is named after the Flathead reservation that is composed of small islands. In this area two industries are famous: One is the orchard farm and the other is a farm for Christmas trees and the local people market them to earn money. The lake ran half way down. The Glacier National Park is as old as 1792 composed of rugged mountains and located in the North-west Montana and Southern Alberta, and are carved of oldest rocks on earth surface. Visitors approach the park from the east; one of the first things he sees is a broad wall of mountains looms in the distance. There are low ranges of foothills east of Flathead valley. Going to the Sun Road in North West Mountain is a beautiful 50 mile drive in North America allowing one to stop, dip hand in lake water, to fill one's lungs with fresh mountain air, and to listen to the wind which sighs through the trees or the chatter of a nearby squirrel. For the first 20 miles the road winds through a forested, glaciated valley. From west glacier the visitor enters the park by crossing the middle Fork of the Flathead River on a high steep ridge. The park is the outcome of the great ice age that began about 3 million years ago. Geologists tell there were four great ice ages that radiated in North America. During the last glacial age, the Wisconsin great tongues of ice surged down all the valleys of what are now Glacier and Waterton Lakes. At present there are 27 glaciers in the park .The numerous waterfalls of Waterton-Glacier region owe their existence in part to the glaciers, snowfields and Crique Lake. There are towering falls like Birdwoman fall and trick fall. The official tree of Glacier National Park is the western larch or tamarack, which is not evergreen and in autumn its needles change hue adding a new dimension to beauty of the autumn. One of the major attractions is the floral display, a Kaleidoscope of colour, carpeting much of the landscape throughout the summer. One has an opportunity to see different species of vegetation like Sagebrush of the open prairies is intermixed with clups of lupine, paintbrush, gaillardia, balsamroot, the wild rose and the wild geranium. The green mantle that cloaks the slopes of the peaks offers food and shelter for a large variety of wildlife like Coyotes, badgers, chipmunks, squirrels and weasels. There is also a water reservoir called Lake McDonald at west entry gate of the park, at Apgar Village, providing opportunities like fishing and boating. From Apgar we went along the east side of the lake McDonald to Avalanche Creek where we visited the Cedar avalanche lake, with a famous wooden trail called trail of the Cedars. The trail of Cedars is one of the most important trails, which is most commonly visited by hundreds of tourists. It is a wooden trail that loops around a certain area inside the park providing best sights of walk in the Cedars grove. We also visited the Avalanche Gorge. 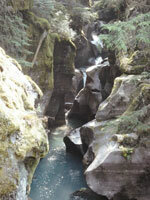 It was a magnificent sight with water running down through the truncated rocks forming a gorge. There were a number of photographers with their cameras fixed at the sight. The ride in old buses to Logan Pass is an unforgettable experience taking one back to the past. The bus has a capacity of about 15 passengers with the tops rolled up to let the visitors enjoy the most of the travel through the park as the driver drives away giving various information about the park. There are 32 transport service buses of old white company of 1936 Jammers, coloured red after the red berry found in the Park. George Burnal established the park in 1910 in the times of president Taft making it the 10th National park of the US in that era. Southern boundary is close to Canada, joining Waterton National Park of Canada. It has been declared as International Peace Park since 1932 with Canada representing the world's longest undefended border. The Waterton-Glacier National Park was declared a World Heritage Site in 1995, for its scenic values, its significant climate, ecological processes and also its cultural importance. The McDonald creek feeds Lake McDonald. The-Going-To-The-Sun road is 50 miles, which was completed in 20 years to be the first international mountain highway which remain closed in October and November due to snowfall. The road being an engineering marvel provides primary access for over two millions visitors annually to experience the glacier's spectacular scenery. There are several famous peaks in the park like Heavens peak. The Park has continental divide; the west side sheds water to the Pacific Ocean and the east one to the Atlantic Ocean. As one moves ahead towards the Logan Pass there are the weeping walls, in fact the water falls down giving an impression of weeping walls. In 1963 and 1965 jet aircrafts were used to fly over the park area to cause the snow to melt with their aerial concentration and vibration and to open the road to tourists. At the Logan Pass there is bookstore in visitor information centre operated by the Glacier National History Association. Autumn is the perfect time for visiting the park where one would see patches of hardened snow around the surrounding landscapes. It was a nice trip and after taking the dinner/coffee at the Apgar village we returned to the campus at about 11pm for a deep slumber after the day long journey.